No secret, I’m a lush for all things TURMERIC! Check-out my YouTube Channel! I use it in my skincare all the time… Love cooking with it too. Most recently though, I’m loving “Turmeric Golden Milk Powder”! Never heard of “Golden Milk”? You’re in the right place. Find below, all the benefits + how you can easily make it INSTANTLY! SEE MY FULL VIDEO REVIEW HERE! WHY ARE PEOPLE DRINKING TURMERIC? Because Turmeric Golden Milk powder is an anti-inflammatory cocktail of goodness. It’s anti-inflammatory powers come from the fact “turmeric” contains: CURCUMIN. By drinking turmeric, mixed with the other yummy spices included in golden milk. You’re getting all the goodness directly into your body, via your intestines. Probably no better way to get this super-spice in your system! 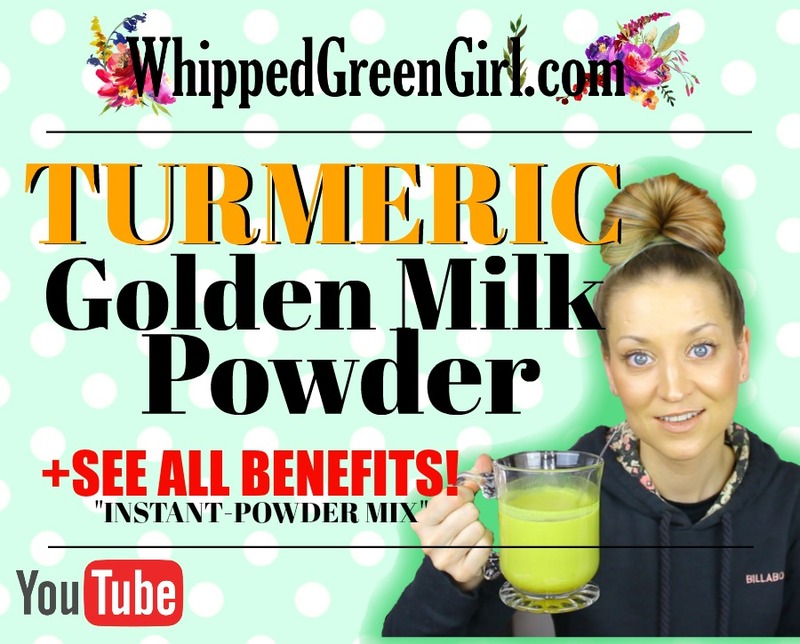 Like I said, I’ve tried making my own complicated Turmeric Milk via Pinterest recipes… Having to go out and buy a bunch of ingredients, blah… Really, I don’t have the time or energy for it! But I want the benefits! 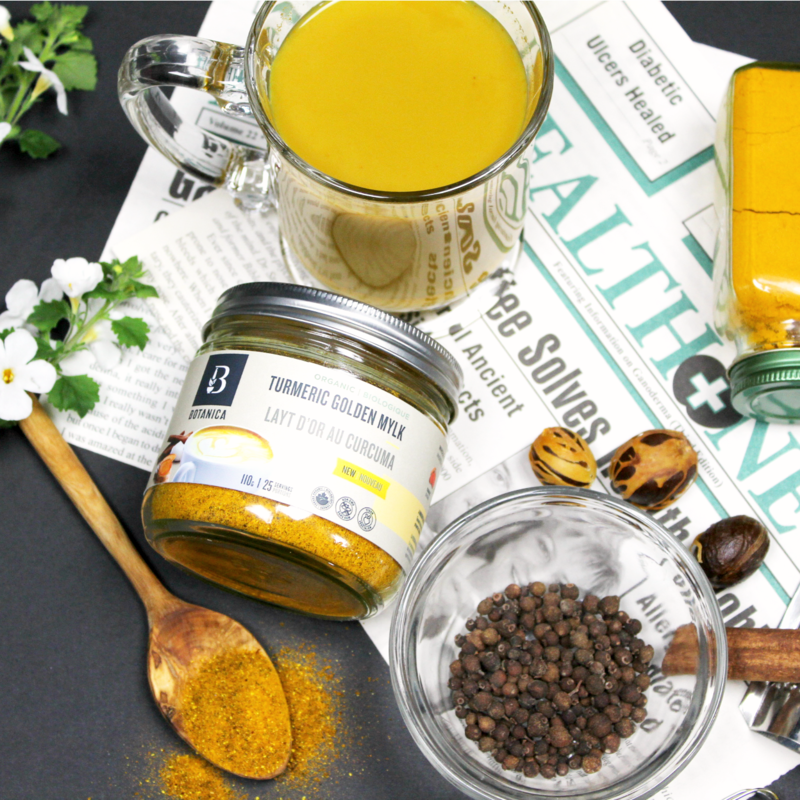 People drink Turmeric Golden Milk mainly, cause of the anti-inflammatory properties (helps with swelling, general body aches & pains)… Botanica produce this golden milk always in small batches, void of any artificial junk. Only whole foods and yummy spices. Ingredients include: turmeric, dates, coconut, vanilla flavor, cardamom, ashwagandha, cinnamon, black pepper. Whisk in 1 tsp of powder mix to 1 cup of water EASY! Taste: mild, nothing strong. Definitey don’t expect a yummy strawberry daiquiri,! Sorry, it tastes like a natural tea. Compared best, I think to a WAY better tasting dandelion tea. Earthy but still smooth. Finally, it’s the subtle pepper I love most. Making that first breath after a sip, truly lovely on the chest! Consistency: watery, same consistency you’d get from any tea… No chunks or lumps! Final thing, AVOID turmeric supplements if you’re on blood thinners, or have thinning blood. Turmeric will only compound the problem. 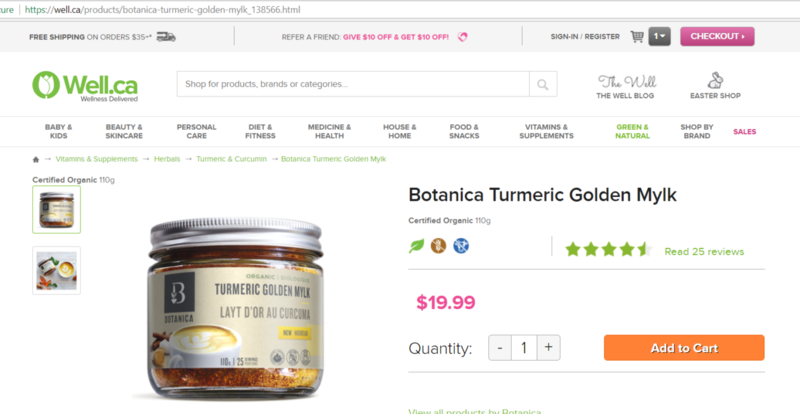 So, anyone on WARFARIN OR COUMADIN – Turmeric Golden Milk Powder probably isn’t for you! I ordered my mix via Well.ca. But, you can also go to BotanicaHealth.com, order it direct from the makers! Plus, Botanica have loads of other health supplements any health junky would roll over for!